Explorers and sightseers from all over the world are drawn to Arches National Park's Trail systems, which encompass a landscape filled with geological curiosities, elusive wildlife, and delicate plant species. 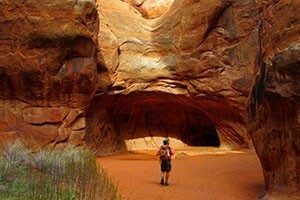 1/2 Day and Full Day Guided Hiking Trips in Arches National Park. 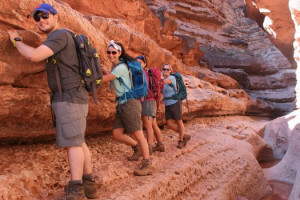 Hiking tours in Arches and Canyonlands along with fully-supported bicycling tours. Committed to adventure over 37 years - we know adventure! We'll show you the hidden wonders and natural treasures of Zion, Bryce, Arches & Canyonlands Nat'l Parks, plus the Escalante & Grand Staircase region. Camp & lodge options. Adventure tours throughout the Southwestern US - scenic, wildlife and photography trips. Great for individuals, families and groups. Looking for a thrill in the desert? Let Windgate guide you in this incredible landscape, whether it be rock climbing, canyoneering or photography. Take a guided walk through Desert Nature Trail and learn about desert ecology. 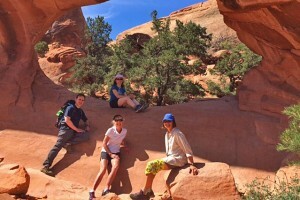 Sand Dune Arch Trail is an easy 30 minute round trip. 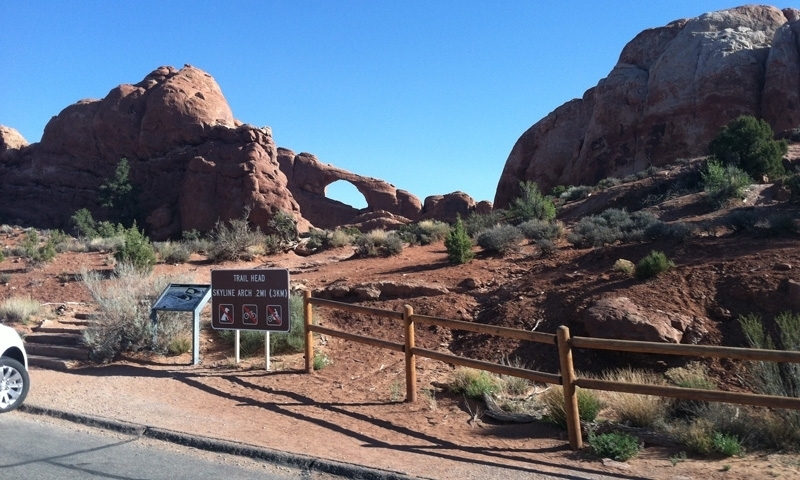 Devil's Garden Trailhead is the longest maintained hike in the park and moderately strenuous. Most trails are marked by rock cairns. 52 foot tall Delicate Arch is world famous. Arches National Park offers a variety of hiking trails suitable for all ages and all levels of experience, but before you and your family set off to explore the desert trail systems, take the time to plan your route and remember to bring a map and plenty of water, as there is very little shade along most of the trails. Trail Overview: This short guided walk helps visitors identify characteristics of the desert ecology and geological features before adventuring further into the park. Trail Overview: This easy hike leads through a sandy narrow slot between two sandstone fins and is great for families with small children. Trail Overview: Nineteen miles north of the park entrance, this hike passes by a number of arches and sandstone formations, including Landscape Arch-the world's largest Entrada Sandstone formation-over 290 feet long. It's the longest maintained hike in the park. Trail Overview: Twelve miles from the visitor's center, the Delicate Arch Trail, one of the most famous sandstone arches in the world, passes by the Ute Hunting Panel and Wolfe Ranch, a member of the National Historic Registry. Trail Overview: This is a ranger led hike that challenges visitors to climb, slide, and shuffle through narrow passageways and a labyrinth like collection of mindboggling sandstone fins. Once you begin the tour, you are committed to finishing. The fee is $10/adult $5/children and you can make reservations online or by calling the visitor's center at 435-719-2299. Note: Pets are not allowed on hiking trails. Remember to carry out your own trash and follow leave no trace guidelines.